Since 1.77 dropped, the P-51D models seem to have had rudder compression issues added to them when using mouse aim. Above 500-550 kmh, the D30's rudder locks up and becomes near-worthless. You're restricted to strict elevator pulls and rolls. At low speeds from 200-450 kmh, the nerf isn't very noticeable. The rudder's authority at high speed is one of the main things that allowed it to be one of the best performing BnZ aircraft in its tier. I've always been an advocate of moving the P-51D30 up to 5.3, at the minimum. However, with this nerf, I think the D30 is now fine where it is at 5.0, and could possibly be moved down to 4.7 if .50 cals didn't perform as well as they did. Other performance aspects such as speed, acceleration, climb, and horizontal turn time all seem to remain the same, as far as we can tell. With this rudder nerf, the optimal playstyle for the D30, which consists of diving from altitude down to your target, then back up, is no longer as viable. You can dive, just as fast, but the reduced rudder authority prevents you from effectively lining up kill shots. 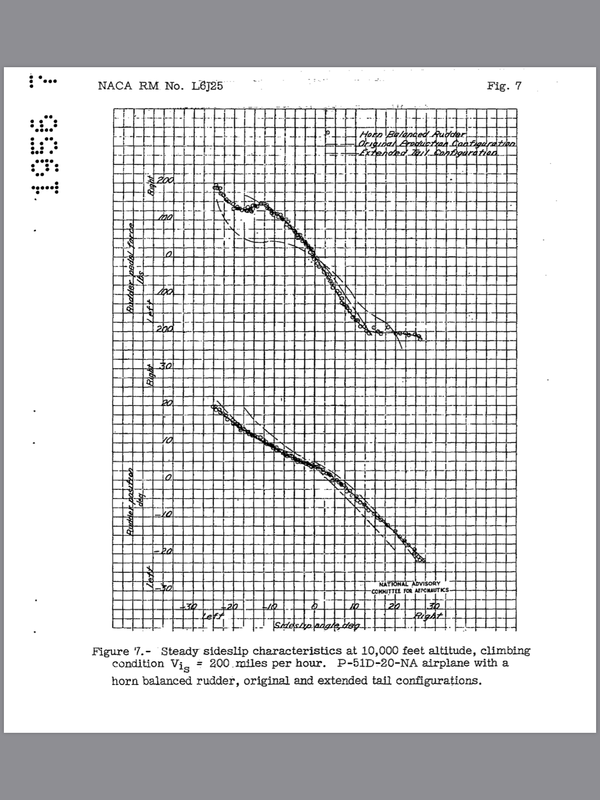 This seems aligned with absolutely no historical behavioral data, also it doesn't seem to be consistent across P-51 types, being worse on the D models particularly the D-30. Therefore, it strikes me as a mistake, regardless it makes the plane not fun and unusable in its ideal and intended role thus I will be shelving it for the time being much like I had to with the F4U last patch when it was afflicted similarly. Interests:Plane, bike, hiking. Aerodynamics, physics, engineering. P-51D models seem to have had rudder compression issues added to them when using mouse aim. So it only happen with mouse aim ? And do you have any historical data to prove that it is wrong ? You don't need to vary rudder input much when at high speed with full real controls, you only use pitch and roll input. As such WT's way of having the instructor be so reliant on rudder input for no good reason is completely ahistorical and a massive hindrance to the one thing US fighters were generally designed for - handling well at high subsonic speeds. Devs should be showing us the historical data proving that the new massive rudder lockup is correct. Asking the community to "prove it wrong" when devs don't even bother to "prove it right" is nonsensical. I do the test flight using full real control at ~10000 ft. Sideslip is done with full rudder applied. Data is recorded from 8111. 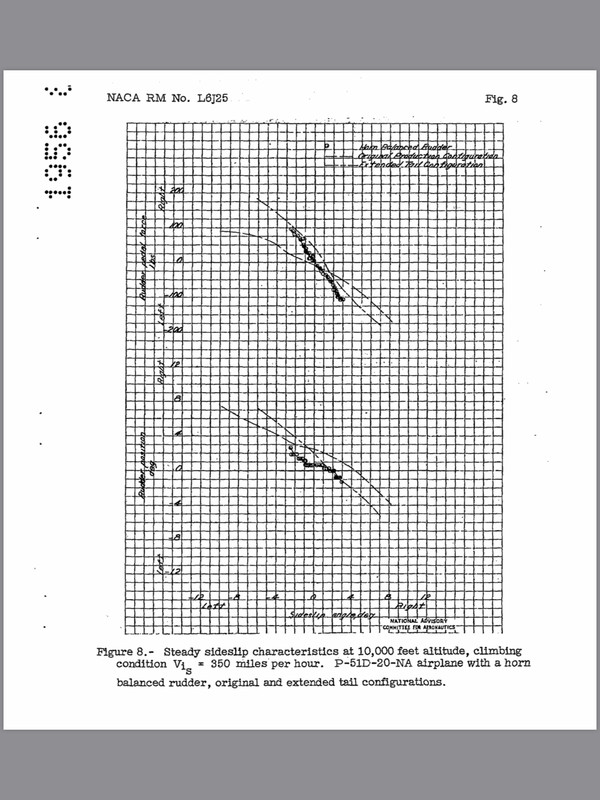 At 321 kph (200 mph), angle of sideslip ~ 15 degree. 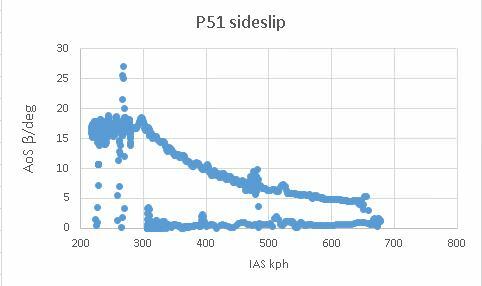 At 563 kph (350 mph), angle of sideslip ~ 6 degree. I also test the rudder control of some other aircraft. P-51 has the worst rudder control. When flying 300 kph+, its rudder starts to lock up. At 321 kph (200 mph), 91% rudder deflection can be achieved. At 563 kph (350 mph), only 30% rudder deflection can be achieved. 30 degree angle of sideslip can be achieved at 200 mph with original production configuration. 8 degree angle of sideslip can be achieved at 350 mph with original production configuration. Max rudder deflection is ± 30 degree. At 321 kph (200 mph), full rudder deflection can be achieved. At 563 kph (350 mph), ±8 degree (~27%) rudder deflection can be achieved with original production configuration. 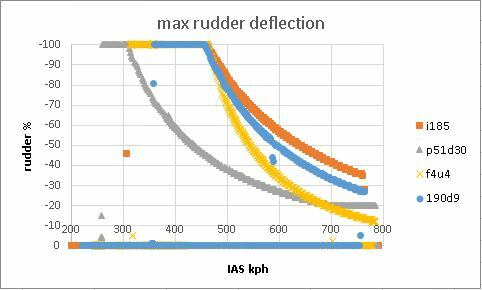 It seems that reduction of rudder deflection at high speed is not far from reality. However, lower sideslip angle in WT does show P-51 under-perform in directional control power. What make the issue more tricky is that mouse-aim instructor heavily rely on rudder to do smooth tracking and aiming. Thus bad rudder control of 1.77 P51 results in significant reduction of RB effectiveness. Additionally, control authority of a lot of WT aircraft are quite unrealistic. I think a major problem of WT FM is their inconsistency. Some prototype aircraft without detail historical data enjoy really forgiving control authority, while some aircraft are fxxx up badly. ex : According to this NACA report of F4U-4, its rudder control force in dive is excessive. However, WT F4U has better rudder control than P-51. I am not sure which is better fix of the issue, buff P51 rudder to unrealistic level (similar to other aircraft) or nerf all the others? I think it's an issue with control methods. The instructor fails to properly align the pitch axis with the target the player is aiming for, or attempts to change rudder input for no good reason during elevator pulls. The latter can easily be observed on a variety of planes when pulling up from level flight with MA and compare this behavior with a full deflection keyboard pullup. With the MA pullup, the plane will always droop one wingtip before righting itself somewhat. I think that I will forward the testing and the analysis. I'd reckon than most planes never were tested as intensively as the P-51D, and that instructor critically relies on the rudder for aiming. Your testing Report is submitted. This thread will remain unlocked for 7 days in order to allow anyone with information / evidence / examples to post them. It will also serve as a place where the developers may post questions for you to answer, so please keep up to date here. Thank you for helping us improving the game.